Marc Kennedy, a member of Canada's gold medal winning curling team, along with his wife Nicole, stopped by the Alberta Legislature today to meet Premier Stelmach and be introduced in the Legislature. He graciously let me (and really anyone who wanted to) hold his medal and get a picture with it. Marc and Nicole were very lovely people and it was a real treat to get to meet them. 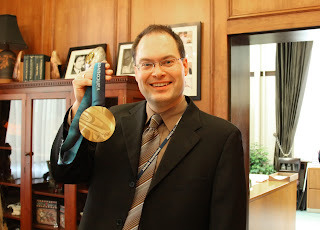 And needless to say, holding a real Olympic gold medal was a real thrill.